One of my favorite kinds of birds are hummingbirds. These tiny little hummers are fascinating to watch as they flit from flower to flower drinking nectar. Then suddenly they will soar up into the sky and land on the branch of a nearby tree. They seem to stop in mid air, then fly off at an angle. I’ve seen pictures of hummingbird feeders full of birds, four or five birds eating at one feeder. The hummingbirds that visit my sugar-water feeders are usually more confrontational. One bird will chase another bird away from the feeder if it tries to land. Occasionally, in the winter two or three birds will eat at the same feeder. We see Anna’s Hummingbirds in northern California year round, with an occasional siting of a Rufous Hummingbird. For many people, one of the most highly anticipated events of spring is the arrival of the first hummingbird. Millions of Americans offer sugar water in feeders to get closer looks at these flying jewels, and to enjoy their antics. Hummingbirds range in size from the two-inch-long bee hummingbird of Cuba to the giant hummingbird, a cardinal-sized resident of the Andes. They come in varying shades of vivid color, their fiery feathers flashing in the light as they fly in every imaginable direction. Hummingbirds are fascinating creatures, but how well do you know them? Test your knowledge with the quiz below. Cornell Hawks: Which Nest Will It Be? 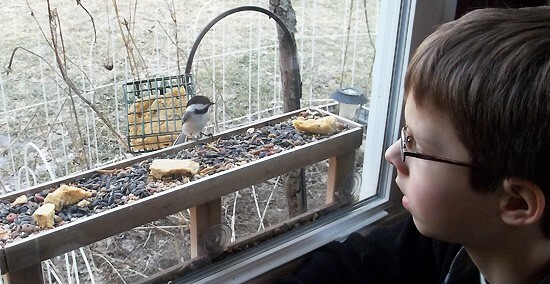 Over the last couple weeks, Big Red and Ezra have been putting on an exhibition for local birders-on-the-ground. Twigs have been brought to both of the nests that they have previously used during 2012-2015 (watch highlight), and it’s anyone’s guess which site will be their final choice. If they keep to the same schedule as in past years, we can expect them to settle in and start laying eggs in mid-March, so there’s still a few weeks for them to choose. We’ll continue posting updates on the Cornell Hawks Twitter feed and on our Bird Cams Facebook page—stay tuned! Owl Eggs Are Hatching in Savannah! The first Great Horned Owl chick hatched last night! Here’s a glimpse of it, all fluffy and dry under mom this morning.The second chick should hatch soon! It has been 33 days since the first egg was laid in Savannah, Georgia, and early this morning viewers were greeted with the sight of a downy white owlet nestled against the second pipped egg. These last few weeks of incubation have given us stunning closeups of the female’s nictitating membranes (think “goggles for owls”) and extreme gentleness around the eggs. But now, the real work of raising the owlets begins, and you’ve got the chance to watch the second owlet hatch live. The mother owl will begin feeding the nestlings food gathered from the surrounding forests and salt marsh. Much of this food will be brought to the nest by her mate or exchanged with the female off camera. Last year’s first meal of Clapper Rail took everyone by surprise, and the owls proved very opportunistic in their prey gathering throughout the season. The young owlets will only stick around the nest for 6-7 weeks before branching out into the surrounding world—don’t miss a minute of the action! Watch the cam, hosted by Skidaway Audubon. The bustling community around our #AlbatrossCam continues to open our eyes to the complex rituals of these majestic birds. Our two nestlings in view, Honua and Kialoa, are now left to explore the site on their own as both sets of parents make the long voyage out to sea for the squid that fuel the youngsters’ growth. They have been returning every few days to feed the young birds, sometimes multiple meals a day, and spending time near the chicks. In addition to breeding activity, the cam site has been visited multiple times by “walkers,” or adults that are not breeding at this site this year. These walkers will hang out with the young nestlings and court with other walkers, often under the watchful eyes of Honua and Kialoa, and sometimes in groups of 3 or 4 adults. 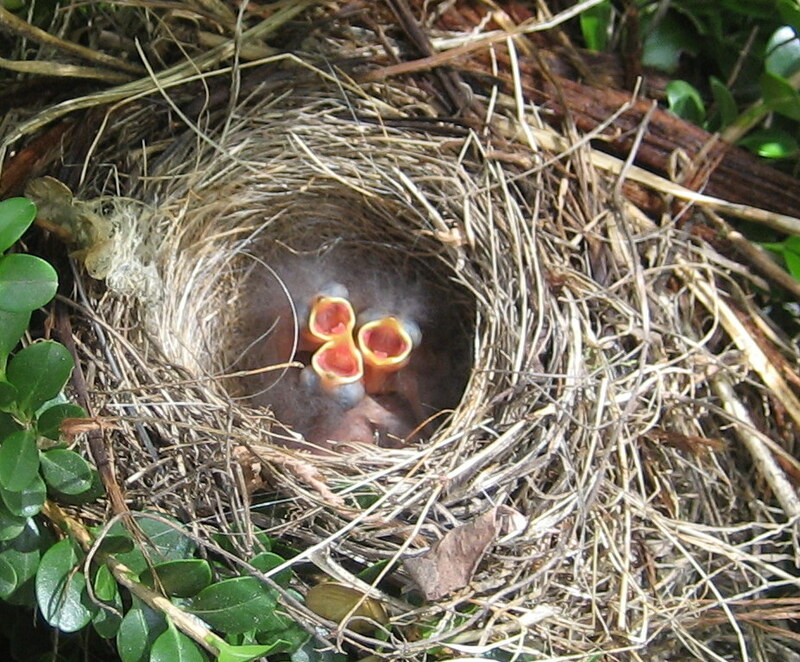 In the coming weeks we expect to see a third nestling emerge from a downhill nest site to join the fray. As I was walking around my backyard I found this little hummingbird nest on the ground. It must have been dislodged from a tree branch by the wind or by a predator. We have had several crows visit our yard this spring and crows are scavengers. They attack smaller birds in nests and eat their eggs. There were no eggs or egg shells on the ground with the nest. 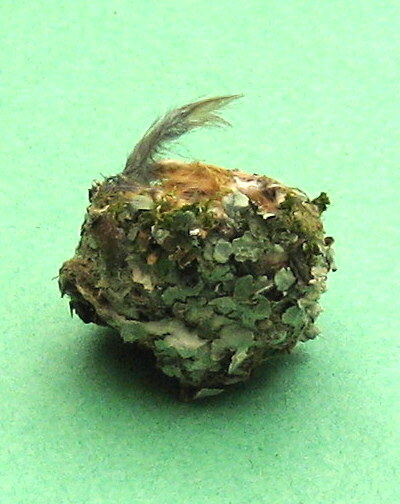 The predominant hummingbird in our area is the Anna’s Hummingbird so I’m sure this is an Anna’s Hummingbird nest. 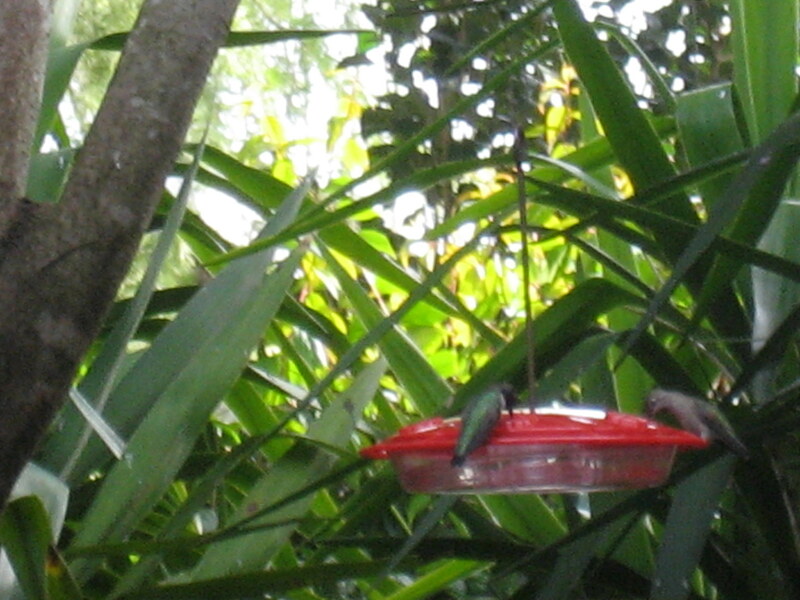 The first photo shows both a male and a female Anna’s Hummingbird. The female bird is the duller colored bird. The second photo is of a male Anna’s Hummingbird showing the brightly colored plumage. 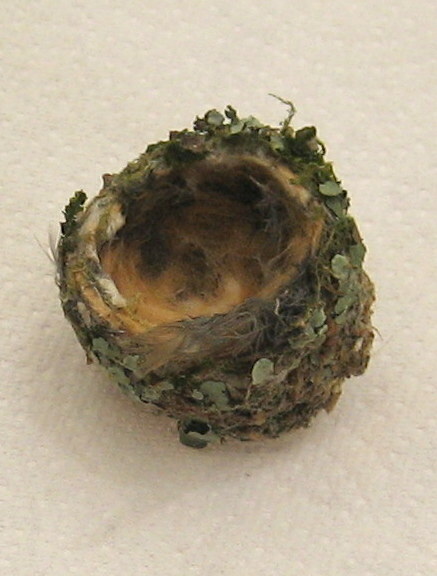 The female hummingbird builds the nest out of plant down and spider webs, sitting in the nest and building the cup rim up around her. 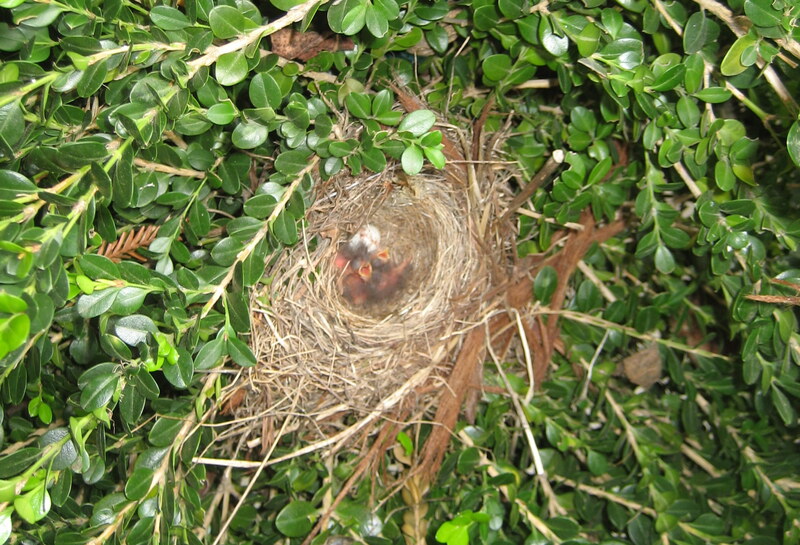 Nests take around a week to build and are 1 inch tall by 1.5 inches in diameter. They may be built of cattail, willow, leaves, thistle, or small feathers and bound together by spider webs or insect cocoons. 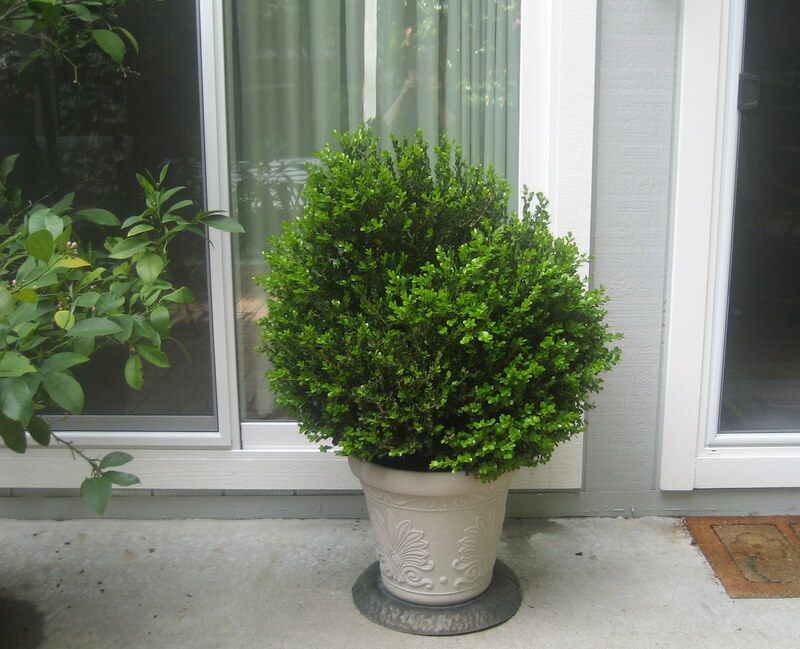 They may decorate the outside with lichens, mosses, or even paint chips. The following are photos of the little nest I found on a white paper towel and a green piece of paper. 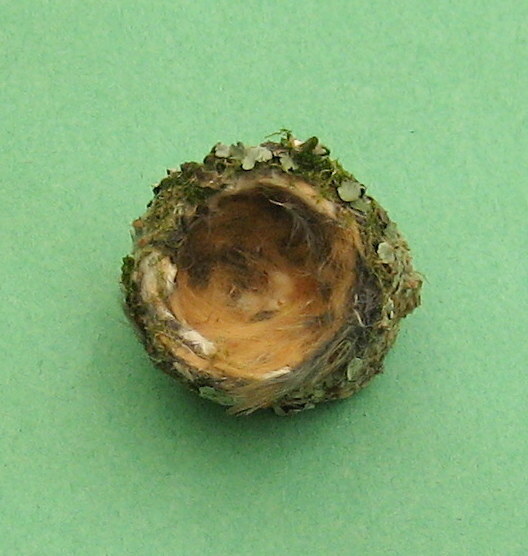 The inside diameter of this nest is about the size of a quarter. 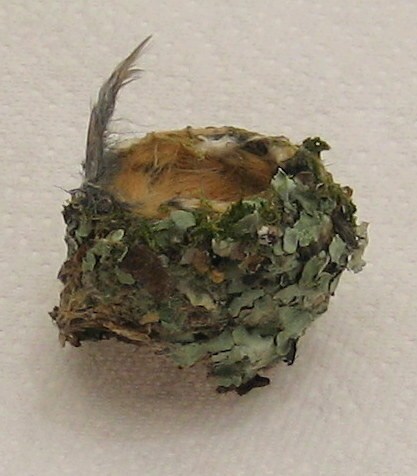 You can see a feather sticking out of the edge of the nest and the lichen on the outside of the nest. 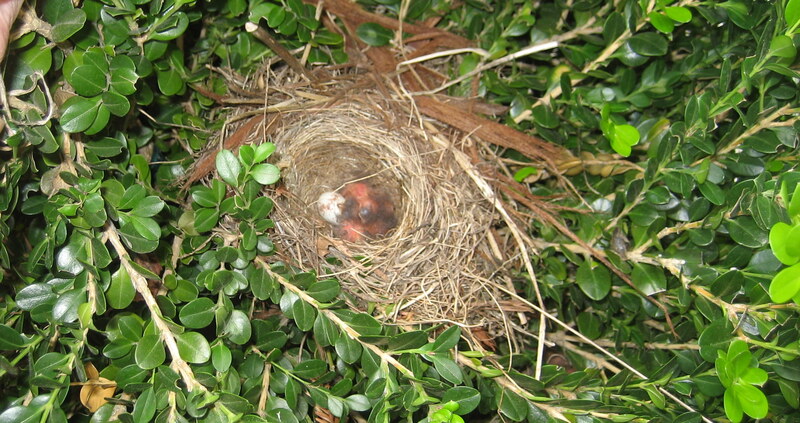 Juncos built another nest in our boxwood bush by our back door, May 2014. 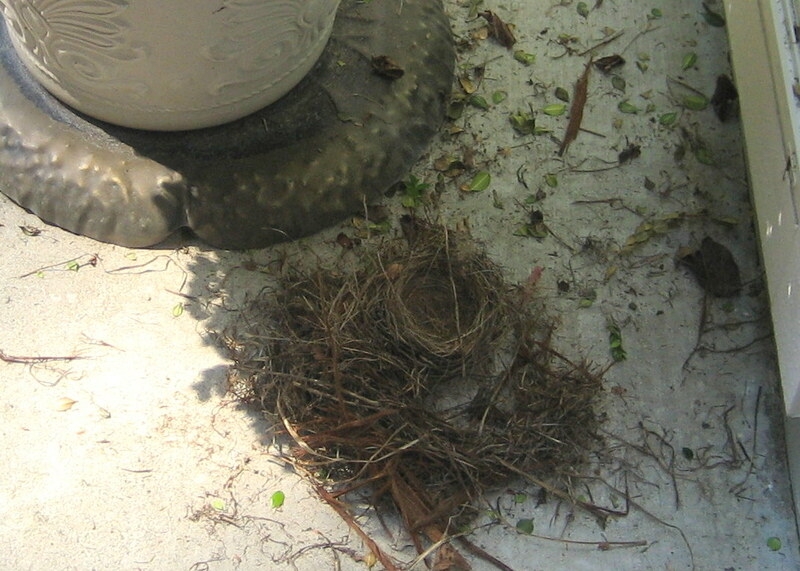 There is no way to tell if these are the same Juncos that built a nest and laid 4 eggs in April. Each time these Juncos laid four speckled eggs, this year and last year. 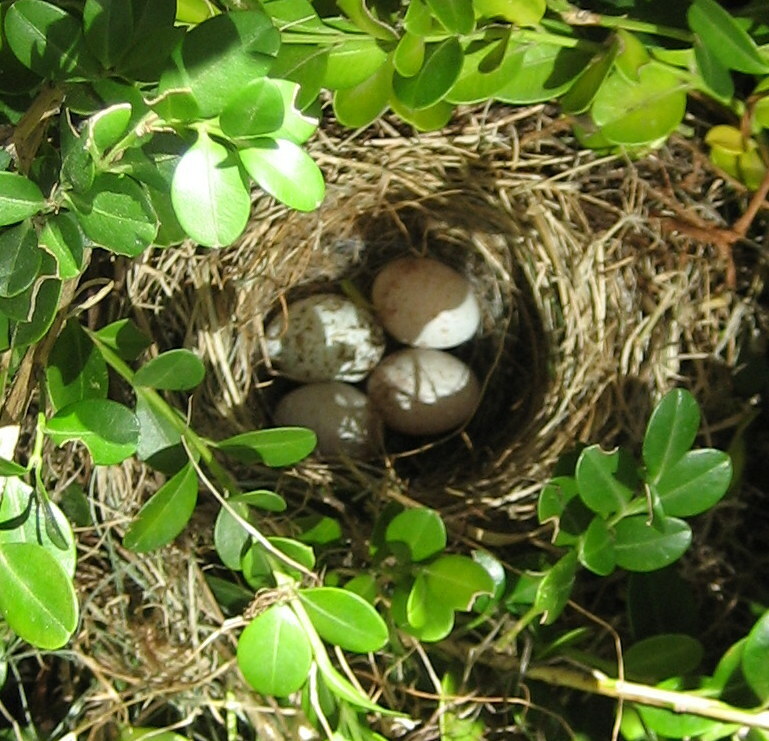 The eggs kind of blend with the nest. 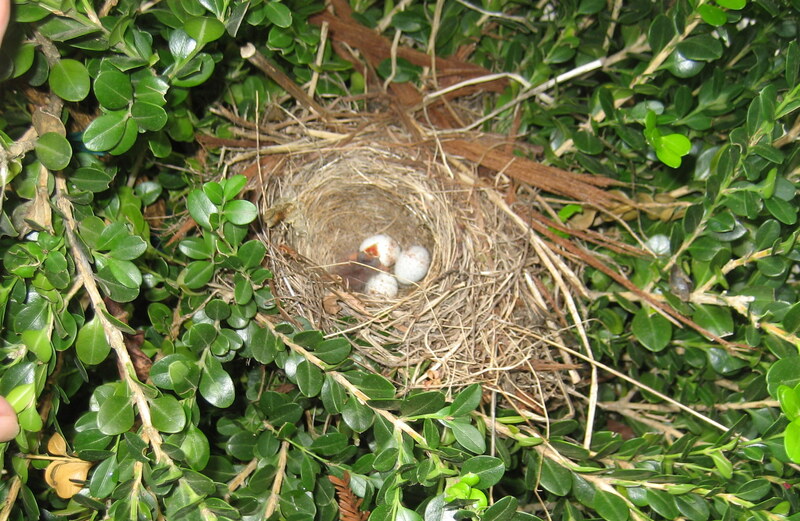 This nest is lower in the bush so I hope the babies will be protected from predators. Saturday morning April 7 I went out to look at the babies and the empty nest was on the ground. I felt devasted because some animal must have found the nest during the night or early morning. 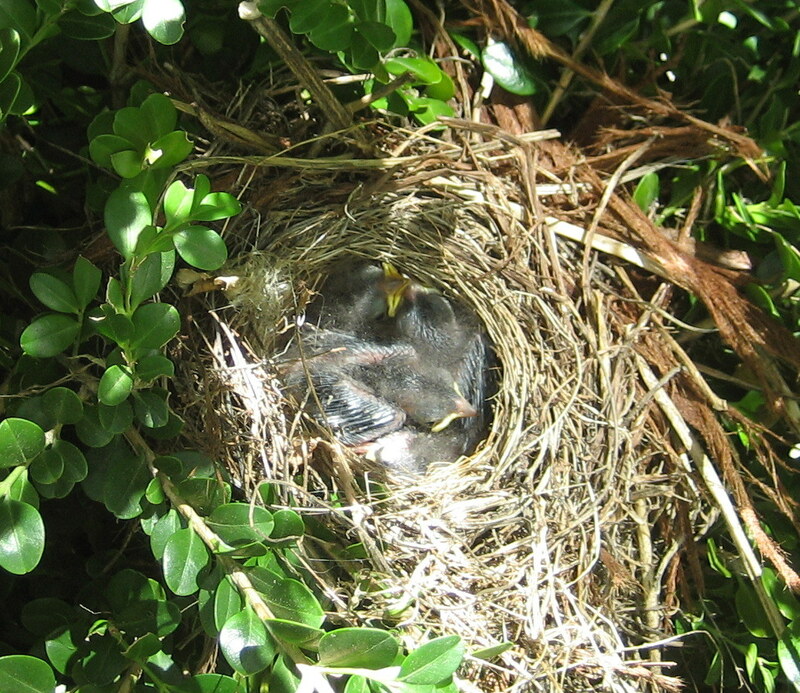 No sign of baby birds! 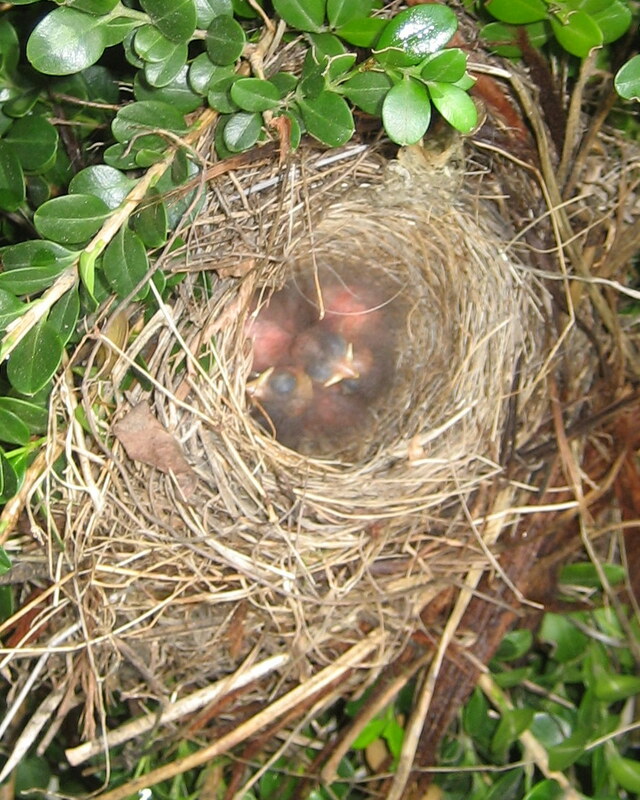 Hungry Junco hatchlings on April 1, 2014 survived the rain storm last night. More rain predicted for today. The Junco pair is back again this year! 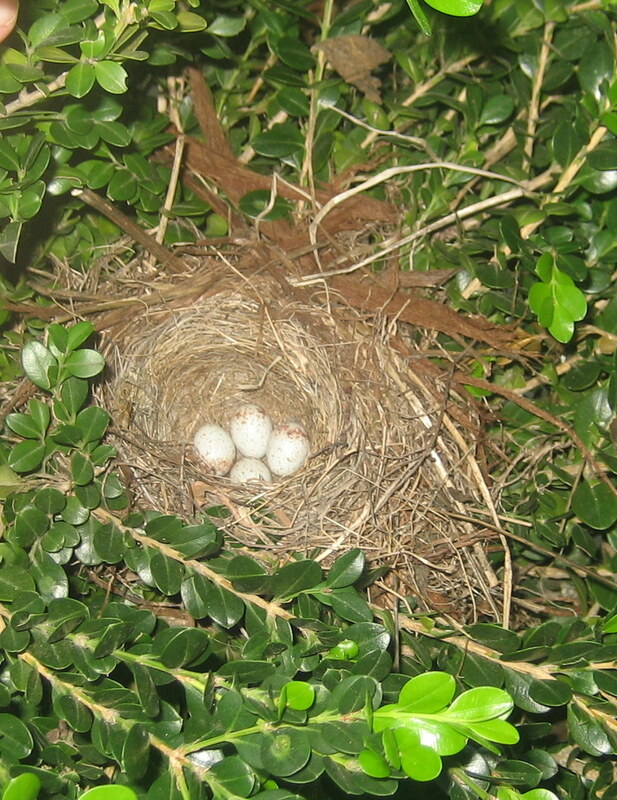 They built a nest and laid four eggs in the same place in the boxwood bush by our back door. I’ve been checking the nest every day. We’ve had rain storms with more rain to come. Today one of the eggs hatched! You can see the open mouth of the little hatchling. New participants must set up a free GBBC account to submit their checklists or use login information from an existing account for any other Cornell Lab citizen-science project. You’ll only need to do this once to participate in all future GBBC events. Click “Submit Your Bird Checklist” at the top of this page or see How to Participate for more details.